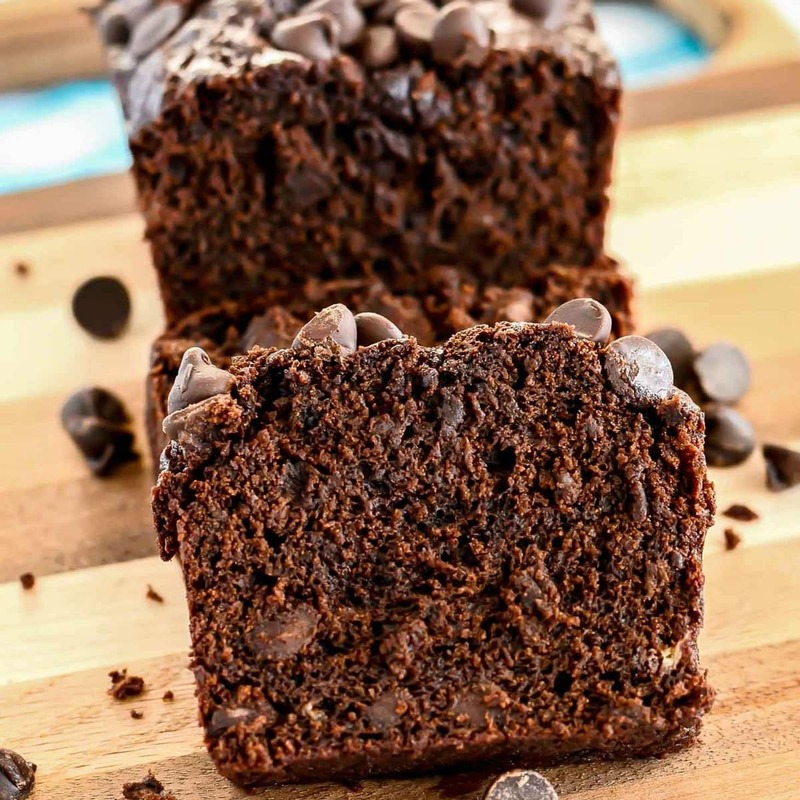 This Chocolate Banana Bread is made with cocoa powder, bananas and chocolate chips, so it is loaded with chocolate flavor! 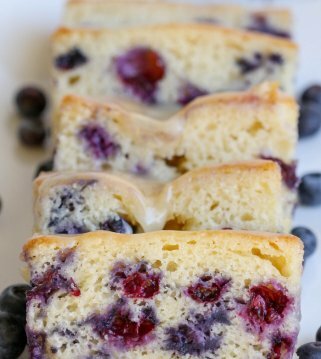 It makes three mini loaves, so you can freeze some for later, or share with friends. Have you ever wondered what to do with those over-ripe bananas sitting on your counter? 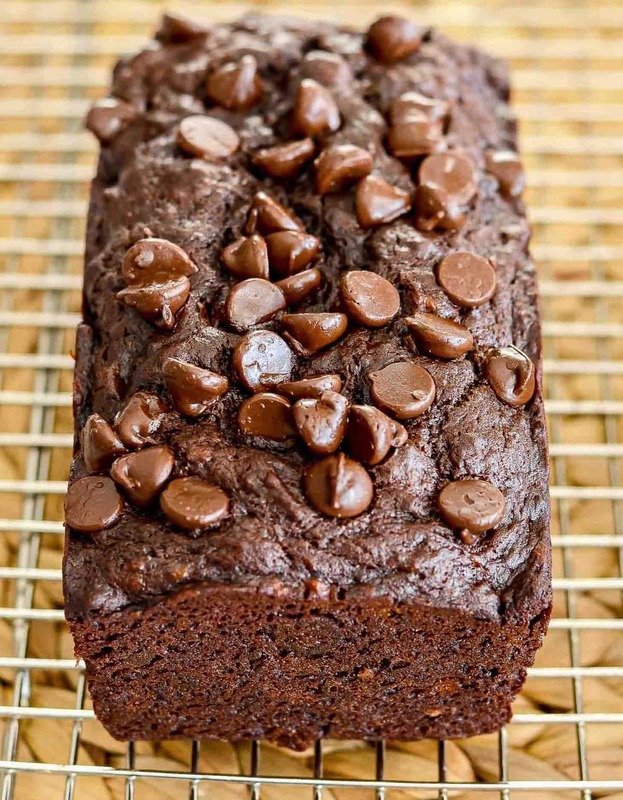 I have the perfect solution for you — make this moist chocolate banana bread! If you love chocolate like I do, then you’ll love the combo found adding chocolate to this classic recipe. 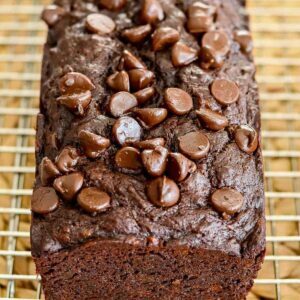 We’ve always loved banana bread, but adding chocolate makes it even better!!! It is perfectly chocolaty, but still has a hint of banana flavor. Plus the bananas make it extra moist. And just look at those chocolate chips on top. Nobody can resist something sprinkled with chocolate chips! Prepare your loaf pans by greasing them well. You can line the bottoms with parchment paper if you so desire. Whisk together your dry ingredients in one bowl and your wet ingredients in another. Combine them together and add some chocolate chips. Pour the batter into your pans and sprinkle chocolate chips on top. Pop the pans into the oven and bake at 350° for about 30 minutes. Want to change up the flavor? I used semi sweet chocolate chips for my loaves, but you can of course use milk chocolate chips if you prefer. You could also use half and half. Or if white chocolate is your thing, feel free to use white chocolate chips. You could also toss in a few chopped nuts. 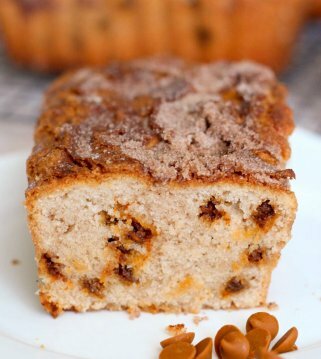 I actually love chopped pecans in my banana bread, but left them out because I was sharing loaves and didn’t want to worry about nut allergies. 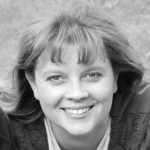 Not that you’ll have leftovers, but in the small chance you do, you can wrap this bread in plastic wrap and store in a cake dome OR you can store in an air-tight container or gallon bag. This bread also freezes well. Just let it cool completely before wrapping in plastic wrap or a freezer-safe bag for up to a few months. 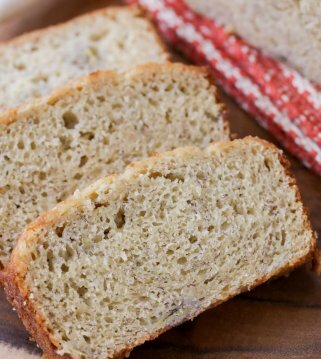 To easily turn this chocolate banana bread into a gift, we like to wrap it in cellophane and add some tulle or jute and add these cute and free gift tags. Preheat oven to 350°. Grease 3 small 3 x 5 3/4" loaf pans; set aside. In a small mixing bowl, whisk together flour, cocoa, baking powder, baking soda, and salt. Set aside. In a large mixing bowl, whisk together oil, melted butter, brown sugar, egg, mashed bananas, and vanilla till well blended. Add the dry ingredients to the banana mixture with 3/4 cup of the chocolate chips. Stir till just combined and divide between the 3 loaf pans. Sprinkle the remaining 1/4 cup of chips on top of the loaves. Bake at 350° for 30-35 minutes or till toothpick inserted in the middle comes out clean. Cool for 5-10 minutes in pans, then remove to cooling racks to cool completely. How have I lived this long and still have never made CHOCOLATE banana bread? This seems like something that needs to be remedied soon! Yes, it does!! It is so good!! SO good!! Love your idea to use a variety of different flavored chips. Should be 🙂 Haven’t tried, but it may need to cook a little longer! We loved this! We made mini muffins and they were so good! They are so moist and my husband and 2 year old gobble them up! Definitely making these again…great way to use up ripe bananas! !